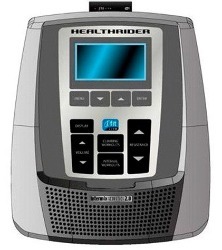 If the HealthRider H30x exercise bike looks similar to a NordicTrack or a ProForm model, it’s because they are all made by Icon Fitness and are simply relabeled for each brand. The Grafixx™ display shows multiple information fields or can display single readouts for speed, time, distance, calories burned, and pulse. The 16 personal trainer workouts focus on hill climbing or long-distance intervals. 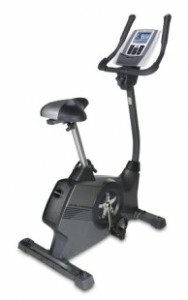 The HealthRider H30x exercise bike offers a freewheel clutch, a magnetic flywheel, and 12 levels of frictionless digital resistance. It has ergonomic racing-style handlebars, padded seat with sliding adjustment, an MP3 / iPod music port, built-in speakers, a power adapter, and handlebar sensors for pulse rate monitoring. 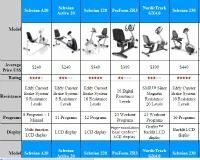 Along with 16 certified trainer workouts, this bike is compatible with iFit Live™ technology so you have the option to pay extra for the adapter and download Jillian Michaels workouts from ifit.com. The iFit features also let you upload your workout stats to a personal account online so you can easily track your fitness progress. The console display will be slightly different but otherwise, the frame, saddle, and components are built at the same factory. These are affordable bikes with lots of features, but the company issues a short warranty of 90 days, hoping that you’ll spend $80 for another year of coverage and some peace of mind. 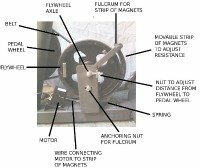 Now that you are considering spending up to $400, we suggest you consider the better quality Nautilus U514 Upright which comes with a 20-lb flywheel and gets many strong consumer reviews.